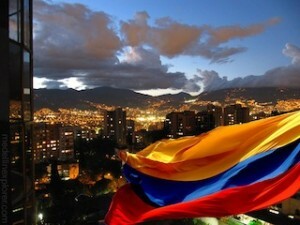 Medellin is the second largest city in Colombia. As of 2012, it’s population was approximately 2.7 million. The metropolitan area of Medellin and it’s surrounding area composed of an additional nine cities, is the second largest urban area in Colombia in terms of population and economy with more than 3.5 million people. The city belongs to the Medellin Metropolitan Area, which is made up of ten municipalities. Medellin is divided into six zones and these are subdivided into 16 comunas. The barrios and urban institutional areas make up the comunas. More than 249 barrios and five townships are part of the municipality of Medellin. The metropolitan area of Medellin lies within the Aburra valley at an elevation of about 4921 feet and is bisected by the Medellin River (also called Porce), which flows northward. North of the valley are the towns of Bello, Copacabana, Girardota and Barbosa. To the south of the valley lie Itagui, Envigado, Sabaneta, La Estrella and Caldas. Medellin features a tropical rainforest climate, albeit a noticeably cooler version. Because Medellin is located at 5,000 ft above sea level, its climate is not as hot as other cities located at the same latitude near the equator. The city’s average annual temperature is 72 °F, and because of its proximity to the equator, its temperature is constant year round, with minimal temperature variations. Because of the pleasant springlike climate all year, Medellin is known as “La Ciudad de la Eterna Primavera” or “City of the Eternal Spring”. However, as the city is located in a valley and many of its districts are on slopes, temperatures can be slightly cooler on the surrounding mountains. The rainy season is generally between Sept. to Dec. and March to May. Rainfall averages 78 inches per year. Not a bad idea to pack a small umbrella. At most, you may need a light jacket or sweater on some evenings. Attire is very casual in Medellin. It ranges from dressed down casual to fashionably casual in the more upscale neighborhoods like Poblado and Tessoro but casual none the less. Very few people wear shorts in Medellin. Even though the temperature is 75-80 °F every day you won’t usually see people wearing shorts. Jeans are acceptable everywhere but overall Colombians are pretty snazzy dressers. Take along some nicer clothes if you are going to be going out on the town. Jeans, Dockers, T shirt, polo shirt, casual cotton short or long sleeve shirt. Tennis shoes, loafers or regular street shoes. Baseball caps are worn by many. Coats and ties usually worn by office, casino and some mall workers. Jeans, pants, cotton tops, light sweater tops, fashionable belts and accessories. Shoes range from tennis shoes to fashionable boots. Skirts or dresses usually worn by office, casino and some mall workers although short skirts are worn by younger adults. At night, ladies are more inclined to dress up especially if they are going clubbing or to discos. You will not see a lot of sweat pants, baggy sweat shirts, ruffled hair or ladies without makeup.